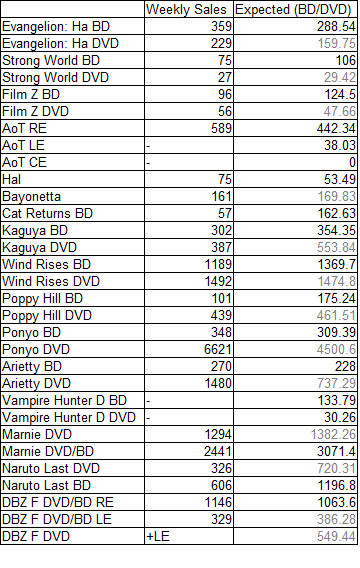 Because of a glitch in the New Years’ DVD data that I caught late and took some time to correct on the figures, this post was delayed. But it’s here now, and we’re getting into what is most definitely the post-holiday set of data. 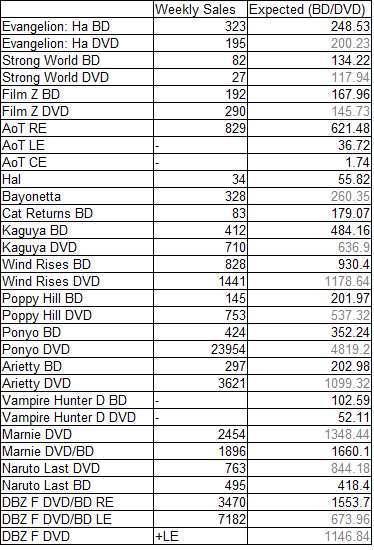 We see typical repeat offenders on this list (Arietty on DVD, Cat Returns on BD, Strong World on DVD) and a few new ones (Naruto: The Last on DVD, both DBZ:F formats). 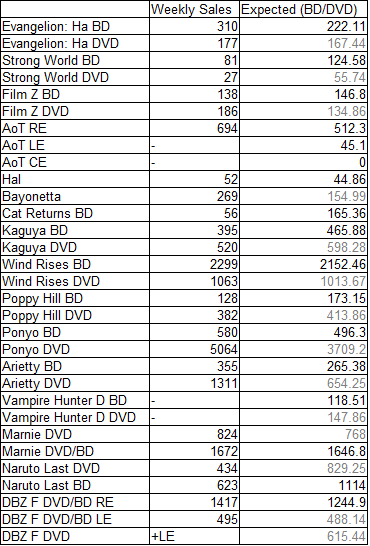 Of particular note is that the DBZ:F DVD releases went from underestimated to overestimated, like they had a bunch of storefront effect causing people to buy them up, and then showed weaker sales in the next two weeks due to tapping out their buyer base in the ‘surge’ week. It’s definitely a cautionary tale, in that the same release can be missed in both directions. -Ponyo moved a ton of DVDs on new years’ week. I don’t have a good explanation as to why, unfortunately, but it’s a mainstream release with over a million copies sold, so the figure is less surprising than it would be from others. Still odd, though. Maybe some third party retailer did a blowout sale. -Marnie’s oscar nomination on the 14th of January led to a steep boost in amazon rankings which were declining into the #500s before and jumped up to the #100s after. The rankings jump is obvious, but the actual amount of additional sales this caused is a trickier fish to skin. We don’t have a lot of baseline data to say that the decline into the #500s was going to continue if not for it – the past 2 weeks both saw rankings hovering around #300 or so, and so that decline, if it were real, had only just begin. Also, the total sales in the Nom week (3753), while greater than the previous week’s (2496) by over 1200 copies, the week before that put up a better sales total (4350) without the strongly peaky rank structure, albeit during the tail end of holiday season. If you assume that it was falling off or would have at least steadied out at the previous week’s level, then the oscar nomination could *potentially* have earned it ~1200+ additional sales in the nomination week alone, not counting a tail in subsequent weeks or the additional jump in ranks after the ceremonies in late February. -The academy awards aren’t the thing that can affect ranks of a release like that. Eva 2.22 showed a stronger set of rankings when 3.33 started shipping hard copies, and the Pokemon movie 1-3 set saw its ranks shift from the #300-#400 range to the #200-#300 range the week when R/B/Y versions released on the 3DS virtual console on February 27th (corresponding to maybe about 70 additional copies sold, but still). It’s probably no coincidence they timed that release for early February so it’d be fully in stock when that was happening. These sorts of cross-release tie-ins are an interesting point to examine, and it’d be certainly neat in the long-run to do a check and see if second season announcements and or manga licenses related to a release cause the product to see a brief sales revival. 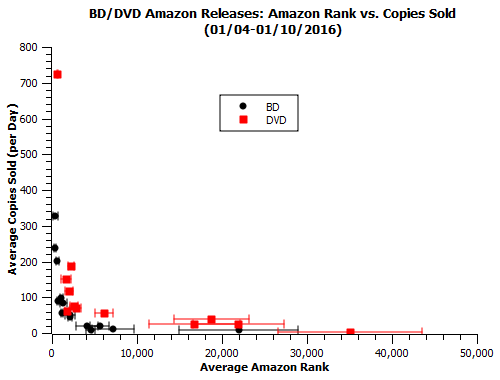 Not sure if you ever address this, but any reason why DVD tends to have higher average sales than BD of corresponding Amazon ranks? I mean, there are a lot of potential factors in play, and the best evidence is still kinda empirical. 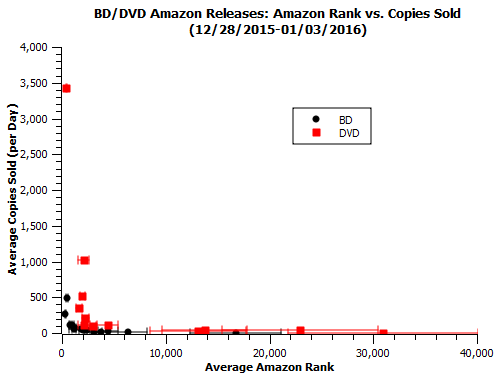 DVDs tend to be lower price, and that might affect how amazon ranks them for a given sales total. Also, DVDs tend to pull in a more casual crowd, so they might be less likely to be buying at amazon vs. at B+M stores or smaller online retailers. 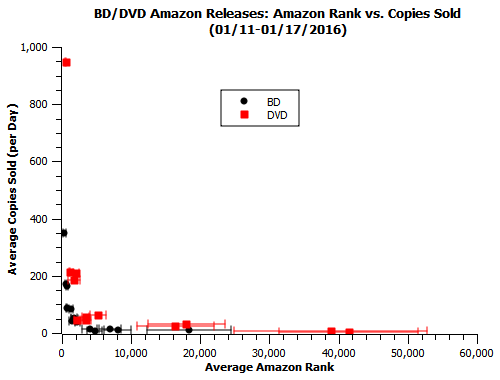 Particularly, people inclined to buy DVDs for price reasons may be more inclined to bargain hunt and thus less likely to make their purchases on amazon, so those ranks alone could simply be less indicative because proportionally fewer people are shopping there.